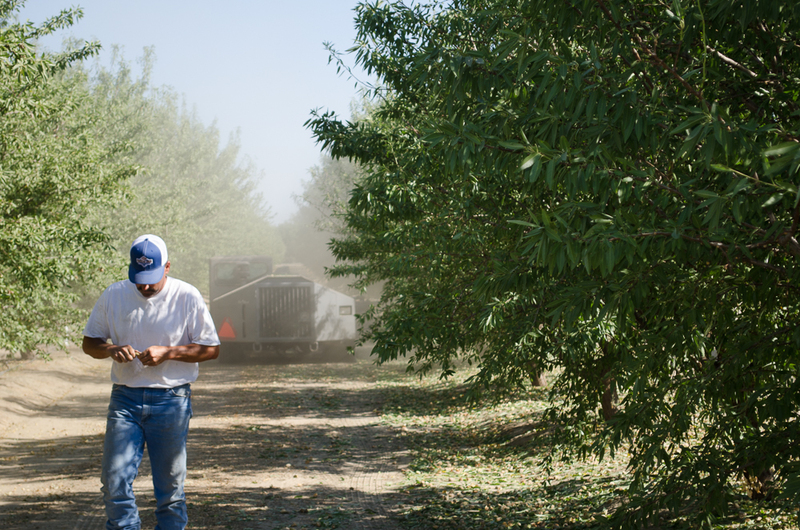 I’ve been working on a special project, writing about almond growers and how they make a crop. It’s been a real education. My son in law Brett Bonomi is one of those terrible almond growers that’s stealing water from the swimming pools of the rich and famous down south, just so he can grow his nuts and feed my grandkids. He works closely with his dad and his cousin, and some of his friends and neighbors. So he has been letting me follow him around this year, to see what he does. I’ve learned a lot. Not only about growing almonds, which is a lot of hard work, but about my son in law. I’ve always liked him, and felt like my girl chose wisely and well when she grabbed him – but this year I learned just how hard he works, and just how wise he has become over these decades. But that was no surprise – He’s a farmer. He’s up before the sun, out in the cold or the heat, always vigilant and aware of his environment, which he does everything he can to keep in the best condition to grow his crop, and to keep the soil healthy for his two young sons to farm some day. His work gives him time to think, and he has to have a deep understanding of the way of things to build the best soil and crop he can. Harvest is the time when he gets his report card on how well he’s doing. This week he was out sweeping almonds. When I showed up with a photographer, I watched him slowly working up the row of trees with a cloud of dust surrounding him, the engine of the sweeper roaring in his ear, the heat of the day already oppressive. He stopped at the end of the row and got out to say hello. He was covered with dust. But his grin was open and honest and I thought how happy he was, and he was doing exactly what he wanted to do – he was a farmer, and he was bringing in a crop, a good one, one he’d made better with his skill and hard work. That’s a farmer for you. They’re good, rock-solid people whose feet are firmly planted in the soil. I’m honored to be part of their world. Previously published on The Western View by AgNet West.